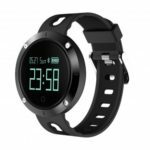 This LEMFO E08 Smartwatch is a health expert on your wrist. 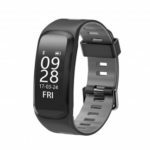 It is multifunctional with heart rate monitor, movement, multi sports mode, message notification. IP67 waterproof for daily use, no worry of water. 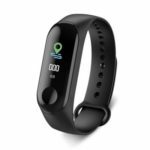 With this smart bracelet, you can instantly receive and respond to your messages, get the exercises data you need to stay active and healthy. With Bluetooth 4.0 technology, this smart bracelet is available for smartphones with Bluetooth functions. Built-in six-axis sensor to bring brand-new sports experience, swimming mode, multi-sports mode, riding mode, making you enjoy your sports time. Built-in dynamic heart rate detection, record the whole process and full heart rate curve of dynamic movement for your reference. Just turn your wrist lightly to wake up the screen. 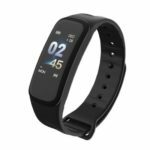 Connect Bluetooth of mobile phone, for dialing & answering, music display, notification pushing, reminder and other convenient functions. 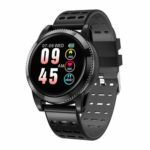 This smart watch can record steps, calories and distance, so you can know your sports data, adjust your exercise program and live a healthier life. 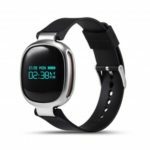 Accurately monitor total effective sleeping time and motion time every night, helping you develop good living habits. E08 remote control phone music to next or up, pause or play. Control your smartphone to take photos, catching every moment you want. Built-in 110mAh battery ensures 7 days duration time after fully charged and up to 100 days standby time when power off. Makes it more comfortable to wear, ensure the stability when wearing in sports occasions.